If you’ve ever watched a dog chew on a bone, you’ve probably noticed how hard she concentrates on it—turning it over, getting a stronger grip, digging her teeth into it. She knows that the best meat is at the center of the bone, so she keeps chewing until she gets to the really good stuff. Believe it or not, that’s not too different than what it means to meditate. Meditation essentially means to chew on something over and over again. 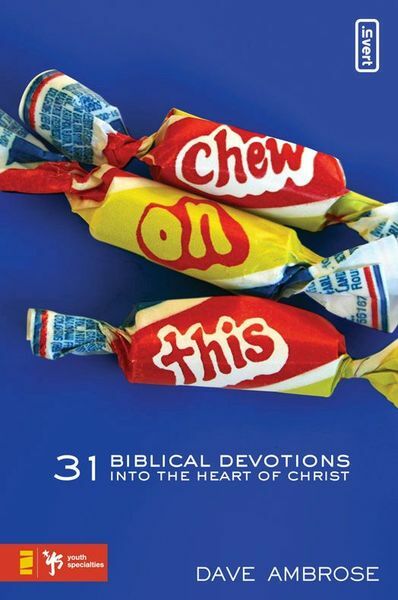 Chew on This provides you with something to chew on that will take you deeper—to the really good stuff. The more you chew on Scripture, the more you allow it to nourish you and give you strength. But even more than that, it draws you closer to the God who created you and wants to be in a relationship with you. During this month long devotional, you’ll walk through guided meditations, journaling opportunities, Scripture to chew on, and questions for reflection. All these experiences will help you discover Christ in your everyday life and grow closer to God. Take a big bite and chew on God’s Word for a while. See how good the “good stuff” inside can really be.